Toyota, the well known automaker from Japan, has its operations spread all over the world, including countries like India. Toyota cars are generally up market cars with great features and excellent performance. India being a growing passenger car market, Toyota has a strong presence in the country. Some of the best selling cars in India by Toyota include the likes of Innova, Etios, Liva, Etios Cross, Fortuner and Corolla Altis among others. One of the top selling cars of the world, the Altis enjoys unprecedented support and customer backing. Hailed as the number one selling car in the world, the Altis is an excellent sedan in all sense. Currently at its eleventh generation, the Corolla Altis underwent a facelift in India quite recently. The current version of Toyota is called the New Toyota Corolla Altis and it has grabbed the attention of the Indian car lovers as well. Priced at an ex-showroom rate ranging from 12.40 lakh rupees to 17.07 lakh rupees, the Altis comes loaded with features and performances. It is more spacious, offer more value for money and boasts of class best fuel economy. There are ten variants of the Altis available in petrol and diesel variants. Considered the flagship model of the company, Toyota Corolla Altis comes with all the luxuries and comforts that one associate with a Toyota car. To top it all, the new car offers great driving dynamics, making the drive an even more pleasurable experience. It comes with a lot of space – both inside the cabin as well as in the form of storage spaces. Although the car underwent many cosmetic changes, the makers have not tampered with the engines. As a result, the new Corolla Altis features the same tried and tested engine featured in the previous generation of the car. Accordingly, the petrol variants are powered by a 1978 cc 1.8-liter dual VVT-I, 138 bhp, 173 Nm four-cylinder inline, 16-valce DOHC engine. It comes either with a six-speed manual gearbox or with an automatic super CVT-I, seven-speed sequential shiftmatic transmission. The four diesel trims features a 1364 cc, 1.4-liter, four-cylinder in line, 87 bhp, 205 Nm D-4D diesel engine with Variable Nozzle Turbo and Intercooler under its hood. It comes only with a six-speed manual transmission gearbox. The diesel variant of the Corolla Altis offers a best in class mileage of 21.43 kmpl. 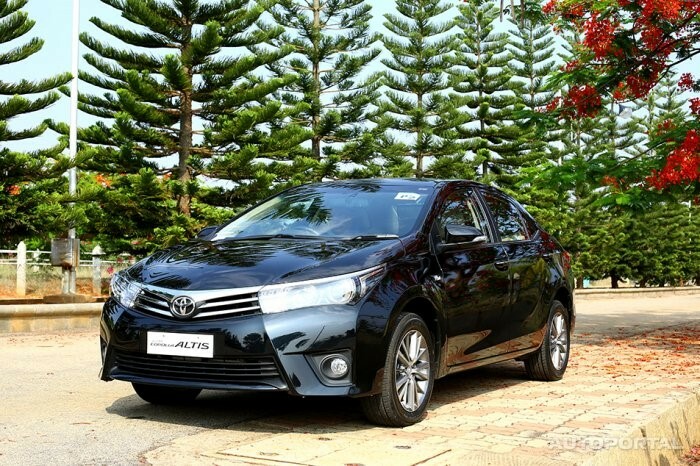 The greatest competition for the 2014 Toyota Corolla Altis comes from other sedans like the Hyundai Verna Fluidic, Chevrolet Cruze, Volkswagen Jetta and the segment leader, the Honda City. However, the Altis comes as a good package and can take any competition heads on. It will be no wonder if the rivalry heats up in the sedan segment in the days to some.